Cleanmgr+ is a new software program for Windows by the maker of CloneApp and CloneApp UA. Microsoft revealed during the release of Windows 10 version 1809, the October 2018 Update, that it deprecated the Windows' Disk Cleanup program. The company started to move functionality from the Win32 program Disk Cleanup -- also known as cleanmgr -- to the Settings application in Windows 10 version 1803. While Disk Cleanup is still included in Windows 10 version 1809, deprecation means that it won't receive new features anymore and will be removed from the operating system eventually. 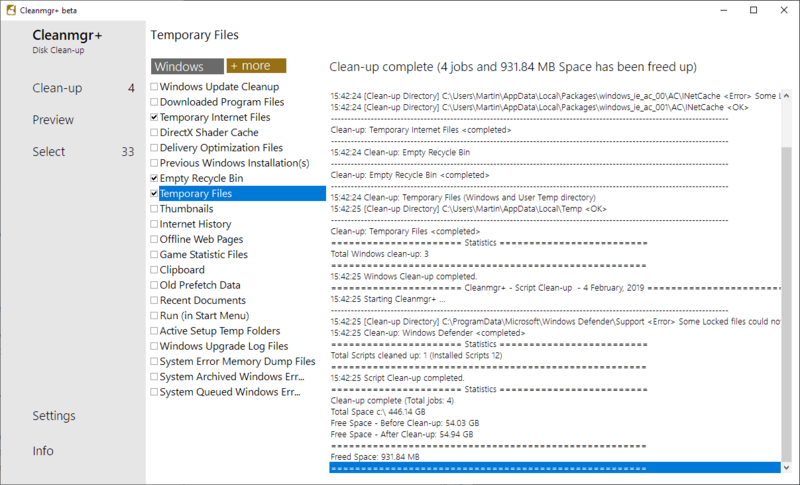 Microsoft did included the ability to clear the downloads folder recently indicating that Disk Cleanup is not dead. Cleanmgr is an attempt to replicate Disk Cleanup functionality. It is offered as a beta version at the time of writing and you may run into issues downloading or executing it. Chrome, the browser I used to download the program, blocked the download initially and I had to allow it manually to complete. The application displays its options in two tabs in the main interface. Veteran Windows users who use Disk Cleanup regularly will notice that it replicates many but not all of the cleanup options that Disk Cleanup offers currently, and that it offers some options that Disk Cleanup does not offer. 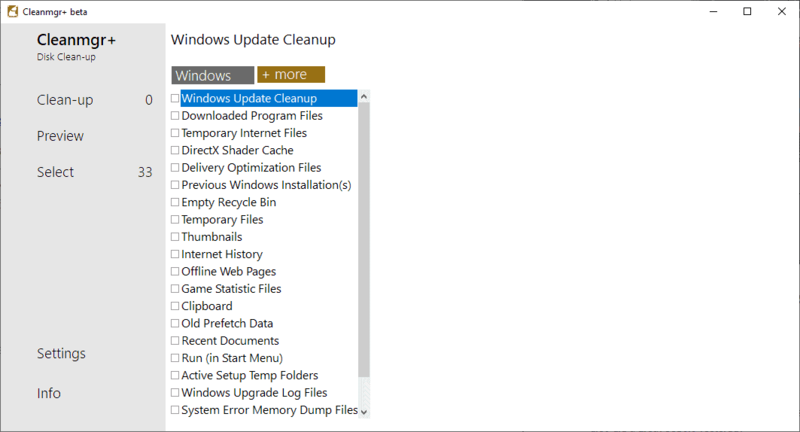 The Windows section lists 21 different cleaning options; that's four more than Disk Cleanup offers. Important options -- Windows Update Cleanup, the deletion of previous Windows installations, clearing of temporary files, or the emptying of the Recycle Bin -- are available. Some options, the cleaning of Language Resource Files or Device Driver Packages, are not supported in the beta version that I ran. A click on More displays additional cleanup options including those not supported by Disk Cleanup. Cleanmgr+ supports the cleaning of browser caches -- Google Chrome, Mozilla Firefox, Vivaldi and Opera at the time of writing -- and some extra cleaning options such as clearing the Windows Icon Cache or MUICache. Just check individual items that you want to clean and hit the preview button to make a dry run. The application displays information about the cleanup if you would run it on the device. The selection of clean-up starts the process; the program displays a log of events and highlights what is being cleaned and the gain in space on the device. Cleanmgr+ is offered as a beta version currently. The program is promising already as it replicates most of the functionality of Disk Cleanup. Some areas need to be improved to make it a true successor though: increase the size of the sidebar that lists the items so that they show up fully. Maybe add an option to compact the left sidebar with the options to make more room for the other sidebars. The main thing that it is missing right now is information about the storage space that each of the data sets occupies on disk currently. Now You: Do you use a disk cleaner? >Microsoft revealed during the release of Windows 10 version 1809, the October 2018 Update, that it deprecated the Windows’ Disk Cleanup program. Anything past LTSB and Server 2016 is absolute garbage! Sounds nice, hope it keeps its promises. I use cleanmgr, CCleaner, Bleachbit. I tend to alternate between them. Some years ago I found System Ninja to clean out the most junk, but one version screwed up my system so I haven’t tried it again. I also had an issue with jetcleaner. While it cleaned out my system junk, the booster addon removed the ability for other users on my system to get to their profiles in window 10. Had to do a system restore to get back access. The Disk Cleanup experience (“cleanmgr.exe”) is being deprecated. We’re retaining the Disk Cleanup tool for compatibility reasons. How about they finish the settings app before deprecating a fully working tool? Everything in the settings app is half done and designed with touch screen in mind. Its horrible to work with. So what does this mean? Is Disk Cleanup staying until M$ decides otherwise, regardless of what happens in Settings, or is it going away? Wearing my marketing hat. There are a dozen popular cleaners already and I am wondering if there is something Cleanmgr+ does that they don’t do. I did not see anything specific in the article or video. You have told us what Cleanmgr+ does but my question is WHY should we consider it? Does it have some specific competitive edge? Do I trust it? It cleared many Gb of space from WIinSxS on my small SSD Win 7 machine. T there were no issues apparent afterwards. However, it does phone home. I disallow that using Windows Firewall Control. How is this different from CCleaner portable? I know mainline CCleaner added phone-home functionality, but I believe this doesn’t apply to the portable version. I have the portable version of CCleaner with options set in a way that should maximize privacy. Windows Firewall Control tells me it tries to phone home in any case. wuhaaaa, hope i doesn’t call home like ccleaner. Is this Windows 10 ONLY? Should work on older versions of Windows as well. Wow. Lot’s of people still using ccleaner. Avast made a good business investment. I prefer Privazeer. At least it wipes traces of internet activity by default unlike Ccleaner. Ccleaner just deletes files and folders by default. Or, you could just use the cleanmgr command. looking nice. I will never use ccleaner again, and the privazer ui is totally confusing. It certainly looks promising, but I hate to install Beta Apps on my computer. I will wait for a stable release, i.e., when it is out of “Beta”. Hint: right click and item to get the option to clean individually. QUOTE: Warning Deleting files from the WinSxS folder or deleting the entire WinSxS folder may severely damage your system so that your PC might not boot and make it impossible to update. After that, get back to Cleanmgr+ right-click Windows Component Store and choose to run the Preview. I was wary about the long list of files after DISM cleanup. A comparison of Microsoft Disk Cleanup, Storage sense and this one would be great. Opinion? Are all false positive? Where do you have this file? Overlayed .EXE? Something is wrong here. I wouldn’t use it. Thanks for the quick information.I also uploaded the website you provided and for some reason the wrong file was uploaded to Mirror1.I downloaded the download link again and the good file came. and it is totally clean!